A few users applaud their Icon experience; they claim there’s a giant array of colors that provide them with endless possibilities. The Curry 6 is also available for customization through UA Icon. The traction is A1 according to nearly all testers. Players can expect the same level of grip on the HOVR Havoc. Many reviewers are commenting that the UA Icon Curry One has excellent cushioning, providing a very good balance between stability and responsiveness. The shoes deliver a one-to-one fit, most claim. A handful of buyers are pleased that they can customize the design of their Curry 1. Some testers comment that frequent wiping is required on dusty courts. One buyer is disappointed because the colors of his right and left shoes did not match. The Charged Cushioning feels firm and unresponsive according to a few reviewers. With a variety of colors to choose from and the ability to upload a personal photo, you can surely make yourself stand out on and off the court. The Curry One is an excellent on-court performer with its superb traction, cushioning, and fit. Add to that the means to create your unique design, and you get another amazing product from Under Armour. I really enjoyed playing in the Curry One, however, they are very similar to the ClutchFit Drive. 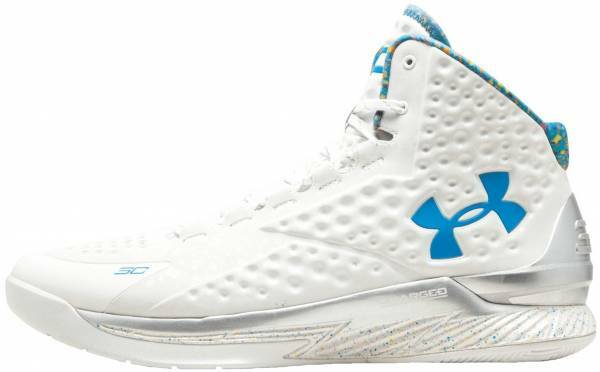 If you are a guard, or prefer a low to the ground responsive ride that doesn’t distract you during use, pick up the Curry 1 as its does a tremendous job of protecting your foot without distraction and letting you do what you do best, perform. The Curry 1 has great traction, cushioning, fit, court feel, and materials. It does everything well at a great price point : Perfect fit, great traction, cushioning, while being supportive and stable. Under Armour Icon makes your sneakers new again through customization. It gives you the ability to tell your story like never before. Be ready to show your creativity with the Under Armour Icon Curry One. Cushion. A layer of Charged foam sits on top of the Micro G cushioning, converting impact energy into responsive quickness. Traction. Similar to the ClutchFit Drive, the Under Armour Icon Curry One has multidirectional traction that delivers superior on-court control and court feel. Length and Width. Most testers agree that the Icon Curry One fits true to size. Lockdown. A heel counter and an internal midfoot shank keep your foot secure while a performance foam upper gives you a comfortable fit. The Under Armour Icon Curry One has a performance foam upper that delivers lightweight support. It also has a padded mesh tongue that offers breathability and added protection. Icon is Under Armour’s first ever customizations platform. It is the company’s answer to MiAdidas and NikeID. It stands out from these programs because it gives buyers the ability to upload images to be printed on the shoe. Besides uploading photos and choosing colors, users can also select from a variety of pre-loaded patterns and limited-edition prints that are fully customizable. Test your creativity and stand out from the rest with the Under Armour Icon Curry One.